Well, I bet you wonder why Fuggle has been quite of late, this is because he has been busy in his burrow looking for something new to add to his brand….. Ta Dah!…… here it is…..If you enjoy a good old ploughman’s lunch, a lavish cheeseboard, a good old chunk of Pork Pie or even a bacon buttie, then you will be blown away by these products. A former Chef has created his own range of Artisan Products and approached Fuggle last year because Jerome from ‘Ome Made, wanted to work with a brewery to enable him to use real ale in his products. Fresh and fruity these accompaniments’ which includes everything you would expect to complete a deli heaven has worked better than anyone could have imagined…..the results are amazing, the first batches have sold out – therefore I hope you get a chance to grab a bottle or two – it’s the ‘bunnies nuts’. 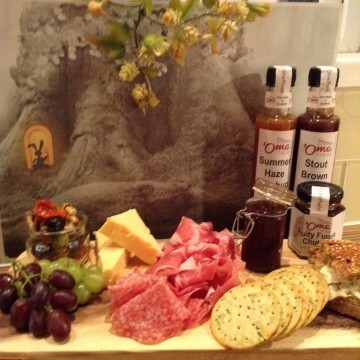 These products are available to purchase from either www.omemade.com or you can hop into the Brewery and purchase in house. If you are a lover of Fuggles award winning ales, you will not be disappointed, they are fuggling fantastic – don’t take my word for it – try for yourself.